Are you excited as I am this time of year? It’s football season, and granted I mostly only care about watching and rooting for our Green Bay Packers, and that means one thing in our house, comfort food. Yes, football season equates to comfort food. Well, you know I can probably make excuses to make comfort food throughout the year, but football season screams all sorts of comfort food recipes, and great creations in my house. This recipe is no exception. My oldest son loves chicken wings. He is one of my pickier eaters so I am always amazed that he likes chicken wings. He loves them so much he cleans them down to the bone, as any chicken wing eater should do, and so I wanted to see if he would try something different, and try these Thai sticky chicken wings I came up with. This chicken wing recipe is pretty awesome. It’s finger food for sure, and has the perfect sweet, sour, and spicy flavors you would expect in Thai cuisine, along with a bit of crunch of the chopped peanuts. Start by lining a large baking sheet with parchment paper. This is optional, however it catches a bit of the fat from the chicken when it cooks. Lay the chicken wings onto the baking sheet, and generously season with salt and pepper. Let these rest while you preheat your oven. Preheat your oven to 350 degrees. Once heated, add the baking sheet onto the middle rack. I cook these for about a total of two hours. Yes, I know that sounds like a long time, but both my son and I love crispier wings, almost as though you would get by deep frying them. After you see the wings getting a dark golden, and almost a crispy texture, remove them from the oven, and flip each one. Continue cooking until the flipped side gets nice and crispy. During this cooking time, make the sauce. Basically you will add everything but the green onions, cilantro, and peanuts to a sauce pan. Cook on medium, to medium high heat, stirring along the way, until it begins to boil, then reduce the heat to a simmer, and continue cooking until you have reduced the sauce in half. This is where that great stickiness will come from on the wings. Pour the sauce into a large mixing bowl, then add in the wings. Toss to coat the wings with the sauce. I added the sauced wings to a cast iron skillet and placed them back in the oven, cooking on 350 for an additional ten minutes. This will allow the sauce to get even stickier and become like a nice glue on those wings. Take that same mixing bowl and toss in the green onions, cilantro, and chopped peanuts. Gently glide those onto your serving dish, and dig in. 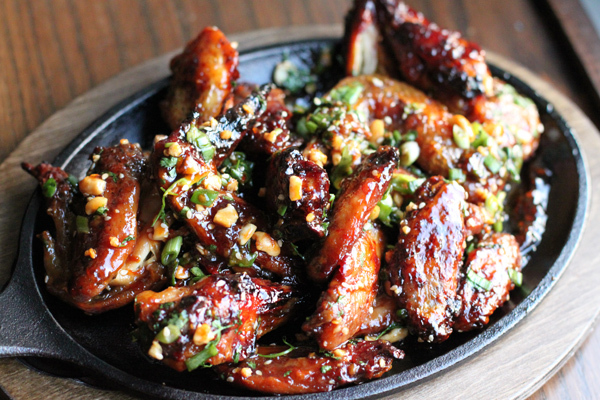 These Thai sticky chicken wings are fun to eat, and are definitely finger food. They are perfectly crisp and and have that perfect pull of a wing. The flavors are out of this world as well. You get the sweetness from the palm sugar, the great bite from the garlic and ginger, and chili. Hands down, awesome chicken wings. Now the question is to lick or not to lick your fingers when you are finished. Hope you enjoy. Preheat your oven to 350 degrees. Once heated, add the baking sheet onto the middle rack. I cook these for about a total of two hours. Yes, I know that sounds like a long time, but both my son and I love crispier wings, almost as though you would get by deep frying them. After you see the wings getting a dark golden, and almost crispy texture, remove them from the oven, and flip each one. Continue cooking until the flipped side gets nice and crispy. I added the sauced wings to a cast iron skillet and placed them back in the oven, cooking on 350 for an additional ten minutes. This will allow that sauce to get even stickier and become like a nice glue on those wings. 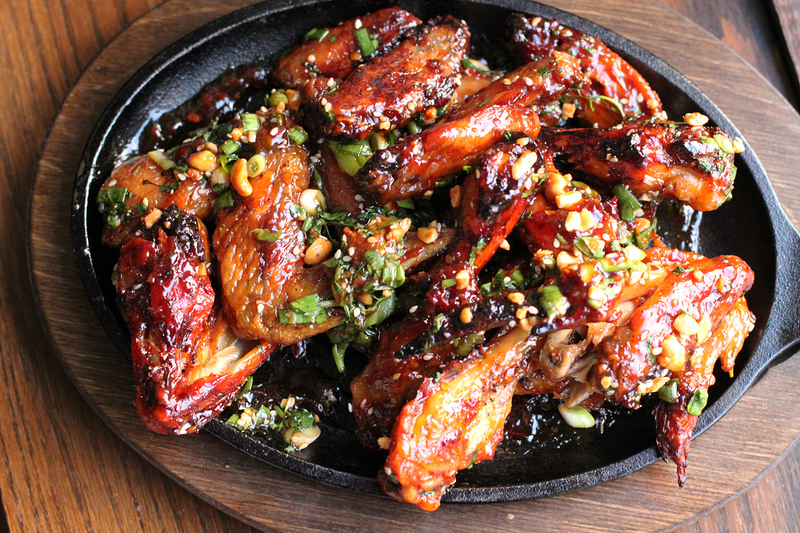 These Thai sticky chicken wings are fun to eat, and are definitely finger food. They are perfectly crisp and and has that perfect pull of a wing. The flavors are out of this world as well. You get the sweetness from the palm sugar, the great bite from the garlic and ginger, and chili. Hands down, awesome chicken wings. Now the question is to lick or not to lick your fingers when you are finished. Hope you enjoy. I can’t wait to try this on wings.. might even give it a go on drumsticks! yum. I made these tonight for dinner. I stuck pretty faithfully to the recipe, which I usually don’t do, but DANG! Yes, they’re not quick to make, but they are easy and DELICIOUS. Can’t wait to make this again with a whole cut-up chicken. Andi – that’s great, and I am glad you enjoyed. These are so delicous and make for a great meal or appetizer. Every time I make them someone asks me for the recipe. Thanks Rebecca! Glad you love them! 5 star perfection! I’ve made these 3 times now and they are devoured every time. I selfishly thought the cilantro and peanuts would deter those with more bland tastes. Nope…they all dug in and loved them. They are my go to when I need to impress now. That’s awesome to hear! Thanks Kimberly. Tried many Thai Chicken Wings recipe, it is the best. We sometimes make some sauce in advance and it keeps very well in the fridge, this way we can make those wings often. Have made this recipe several times and it is loved by everyone.